TOFW has one big goal in 2019: to help you increase your spiritual capacity to receive personal revelation. When each of us accomplishes this goal, we are able to grow, minister, and righteously influence those around us. While all of us want more revelation to guide our lives, it can sometimes feel hard to come by. Because, let’s be honest, life can be noisy and full of distractions. Whether it’s the nagging of your never-ending to-do list, a very difficult and personal struggle with anxiety, or the noise of social media, we can easily find ourselves disconnected from heaven’s voice. Our prayer is that when you attend TOFW you will be able to quiet the commotion and find the personalized inspiration needed to develop what Julie B. Beck called, “ . . . the single most important skill that can be acquired in this life” (“And upon the Handmaids in Those Days Will I Pour Out My Spirit,” Ensign or Liahona, May 2010, 11). We are grateful for the opportunity to come together and bask in the blessing that is personal revelation this coming year. Christmas is less than five days away. And if you haven’t found the perfect gift for your mom, sister, niece, aunt, mother-in-law, sister-in-law, mission companion, or friend and you feel like your hair is on fire, we’re here for you. That’s because the perfect, thoughtful gift for the great women in your life is right here and it takes less than five minutes. Give them (and you) a weekend at Time Out for Women. 2. Find the city closest to you. 3. Click register and enter your payment information to reserve tickets for an experience you’ll always remember. 4. Take a nice, long sigh of relief. Christmas is coming in fast, but now you can watch cheesy Hallmark Christmas movies and drink hot chocolate instead of worrying about where to find the perfect gift. It’s Christmastime! And for many of us, that means the hunt for the perfect Christmas presents is underway. But if memories of years waiting in long lines and spending hours browsing the internet for the perfect gifts still haunt you, we have the perfect solution. Instead of wasting time searching and then worrying about whether you got the right gift or not, why not give the women in your life something their sure to love: a TOFW experience. It’s basically a gift for you too because the best part is it takes less than five minutes give. Hallelujah! Click on “Register” to find an event near you. Click “Buy Now” and fill in your information. You may have noticed we're making a few changes to the 2019 TOFW tour. And because TOFW has become a longstanding tradition for so many of you (for which we are grateful), we want to explain why. Why aren't you coming to (FILL IN THE BLANK CITY)? We wish we could bring TOFW to every city, every year, but it's just not always feasible. As we plan a new tour we evaluate a host of things including venue access and availability; speaker and staff capacity; and the ability to sell enough tickets to cover the costs of holding an event this size. We recognize that some of you don't have as many opportunities to gather and be spiritually uplifted, and it weighs on our hearts and minds. So we are exploring how we could use technology to make TOFW an annual experience for more of you, wherever you live. As we have in the past we will continue to look at rotating which cities we visit. Why isn't there TOFG this year? It's been a tradition to bring Time Out for Girls to many of our TOFW tour cities, but after careful consideration, we have decided to push pause on TOFG for 2019. We recognize the great responsibility that comes with inspiring and influencing our Latter-day Saint youth and it's important to us that we do it right. This break will give us the opportunity to evaluate and assess how to best serve these remarkable young women. What is the price structure for TOFW? TOFW has always existed for something bigger than making money. We exist to lift and inspire faithful women who will in turn influence families and communities. That's why we've always been committed to keeping registration as low as possible. Are there changes to the format? We have one big goal: to create an event with you in mind. Over the years, we've heard a couple of recurring themes. First, that it's tricky to get dinner and get to the event on time. And second, that by the time Friday wraps up, you're exhausted. Additionally, we know lodging has often been a burden. So we've decided to pack more into Saturday to address these concerns. You will be hearing from the same number of presenters and musicians as before so you’ll be getting all the content you’ve enjoyed in the past. And because we know many of you are local and looking for something to do, we're creating a casual Friday night, "come and go" experience. You'll be able to pick up your event materials, socialize, meet the presenters, shop, and enjoy a special mini-concert or speaker (more details to come!). It will be a fun, relaxed evening. We all need our sisters. You know, the women we can always count on, whether we’re related or not. So why not set aside a weekend to feel the Spirit with the women you love most? Not to mention, the chance to enjoy a Spirit filled weekend together. With all the distractions in the world today, it’s more important than ever to stay focused on what really matters in life. Why not take a second and re-evaluate our goals while listening to inspiring stories from other Latter-day Saints? We all need “you got this, girl” reminders. Come and hear uplifting messages to remind you that you are a daughter of our Heavenly Father and there’s nothing you can’t do with His help. We can easily get caught up in our day-to-day gospel bubbles and miss seeing and appreciating the different perspectives out there. TOFW will give you a fresh perspective on doctrine from Latter-day Saints scholars that will help you learn more about every day doctrine. Let’s be honest, sometimes the only way we can get me-time is by hide in the pantry with our secret chocolate stash. No more! Come and spend some uninterrupted spiritual me-time. We all experience storms of life that leave us feeling like peace is out of reach. But when we gather in places where the Spirit can calm our minds and hearts, we find peace. Set aside a Spirit filled weekend to search for peace and answers to life’s questions at TOFW that will help you better endure your trials. From time to time, we all need to re-center our lives on Christ. It happens, and luckily, there are places like TOFW where you can take a second, catch your breath, and invite Christ back into your life. Here’s a secret: pretty much everyone cries at TOFW. It’s a fact, like gravity or rush hour traffic. But you have to don’t worry about “cry-shaming” because you’re among friends. We’ll laugh together and then cry together, because that’s what sisters do. Answers to our spiritual questions come in a variety of ways. They may come during scripture study, while listening to the lyrics of your favorite song, or the advice of a dear friend. TOFW provides the perfect environment to feel the Spirit and the Lord may speak to your heart and reveal some of the answers you have been seeking. Announcing the TOFW 2019 Tour! We are so excited for our 2019 tour! And so, with no further ado, here are the cities we will be visiting during our 2019 TOFW tour! We can’t wait to see you there! It’s been a tradition to bring Time Out for Girls to many of our TOFW tour cities, but after careful consideration we have decided to push pause on TOFG for 2019. It’s as easy as pressing print! 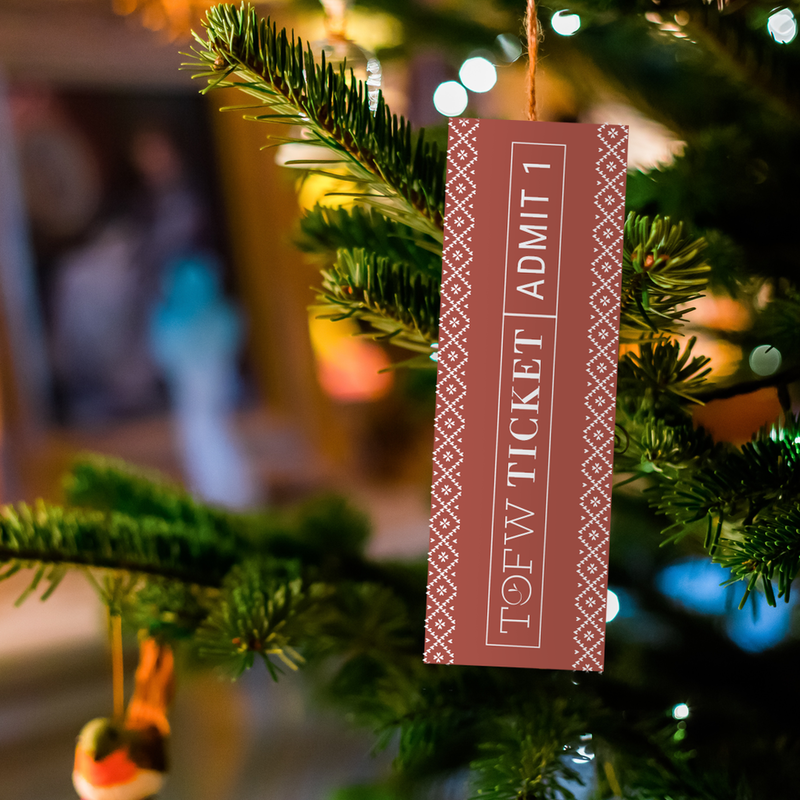 Download this adorable Christmas card to give with your gift of TOFW tickets to the special women in your life.